MadPsychMum | Singapore Parenting + Travel Blog: Jumperoo, Who? An ex-churchmate of mine, Elaine, runs a business renting out toys to mothers at Rent That Toy. I found out she was running this business out of pure coincidence. I read about it in the parenting magazines that I bought and went online to find out more about their services. When I read the "About Us" section, I recognised her from the pictures! So I told my mum-in-law about their service and she thought it was a great idea. We've been wanting to get the Fisher Price Deluxe Jumperoo for Baby J since she loves to jump (have you seen her thighs?) but it's a little pricey. She'll also outgrow it in 2 months and we have nowhere to keep it. Renting it became our solution! Anyway I registered on their website and Elaine messaged me on Facebook to ask me when I would like it to be delivered. She also informed me that my friend Belle (the one I mentioned in the previous post) also used their service too. Small world eh. Initially baby J was super apprehensive. She looked really scared and cried when she realised that the thing actually moves when she kicks. Plus the music together, it all seemed to overwhelm her. So we took her out and kept trying every few hours. As you can see, she finally got the hang of it and now really likes it. 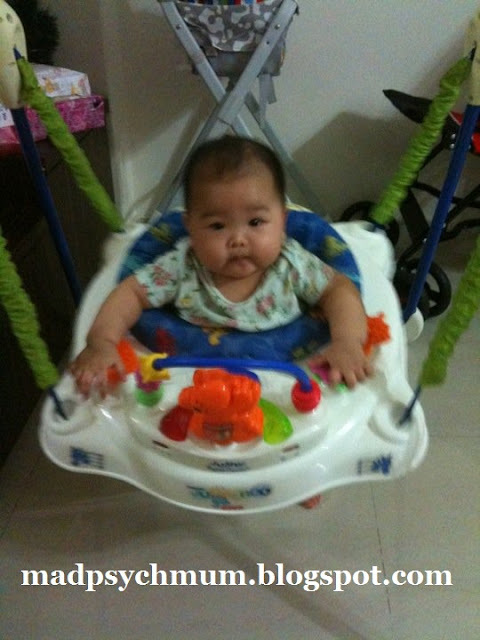 I intend to not extend the rental period of one month as it says on the site that the maximum weight that the jumperoo can take is 12kg and my girl is already 9+kg.. We'll most probably rent another toy for her to play with. Wonder what we should get... any suggestions?